Local craftsman Bob spotted this shocking scene in Home Depot on New Year’s Day. 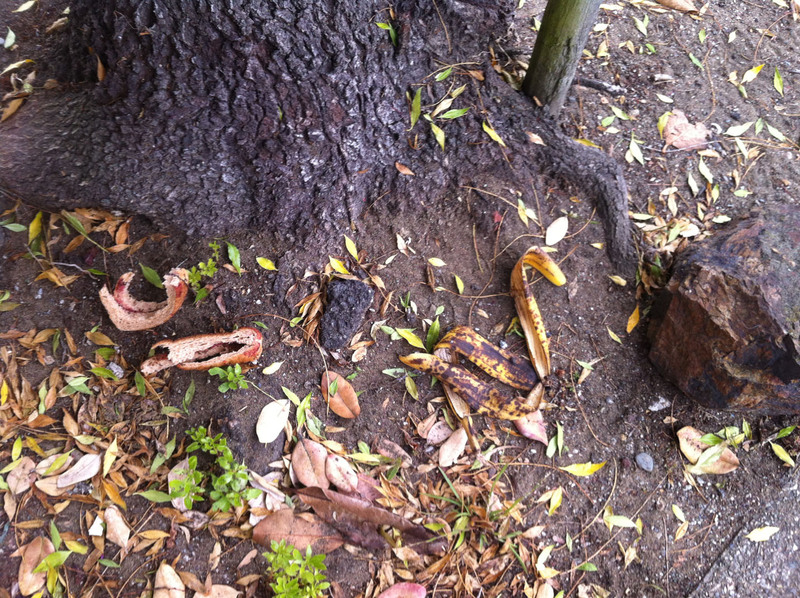 Local craftsman Bob made a New Year’s resolution to clear out the termites in his home. 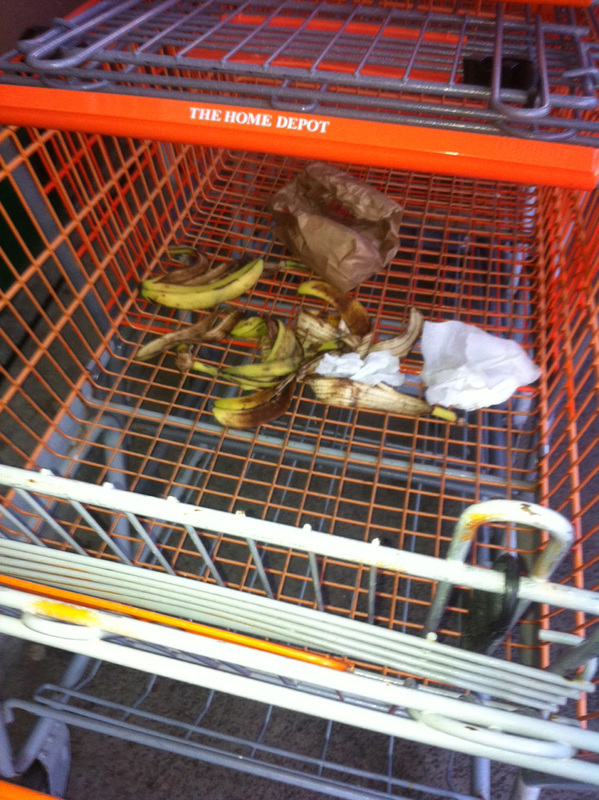 He dragged himself to Home Depot to get some supplies, when he came upon something even worse – a seething nest of peels, waiting for him in his cart! He did the right thing and contacted us. Let this be a lesson to always check your cart before using it. Spotted at 11:03 AM on December 6. Despicable. We can only speculate as to what happened here on December 20, but it looks like some unlucky bird wasn’t fast enough to escape the jaws of this slimy beast. I bet you’re wondering what happened to me. I bet you lay awake at night wondering where I was. 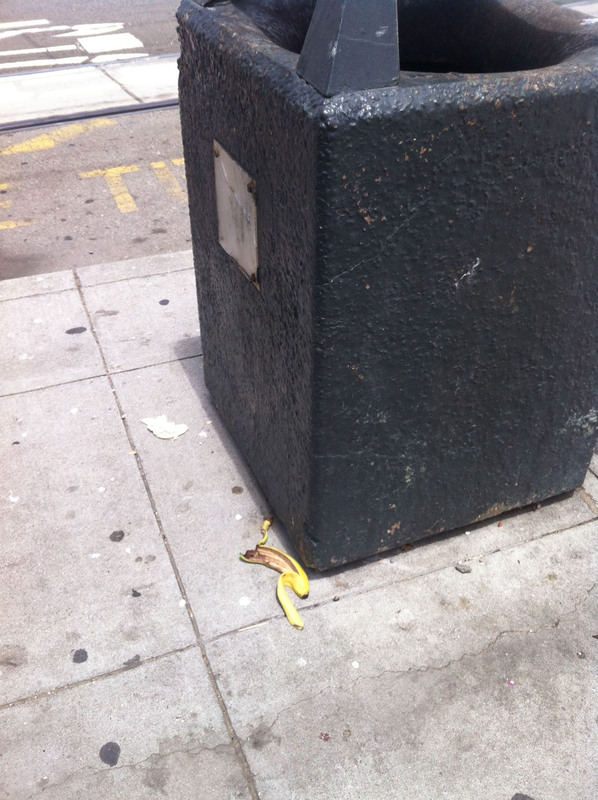 Maybe you slipped on a peel or two since I wasn’t here to warn you. Sorry about that…. 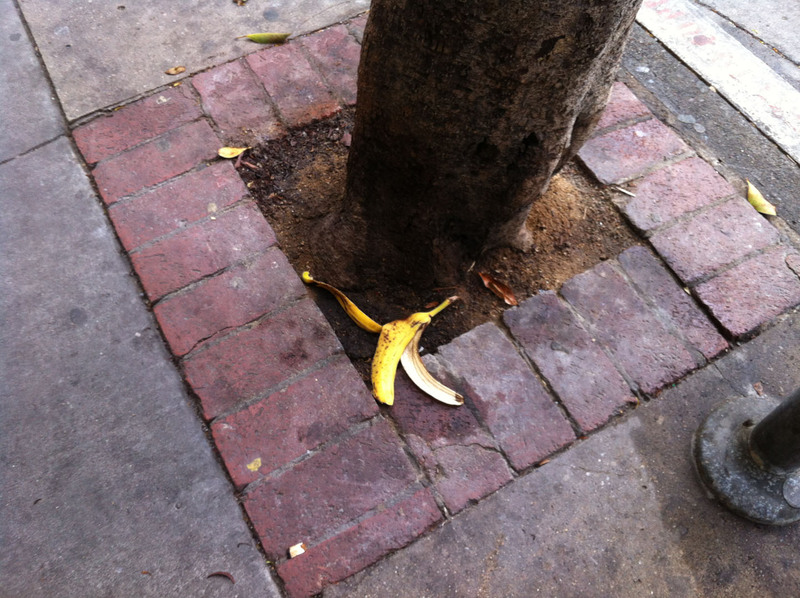 Anyway, watchoutbananapeel is back! 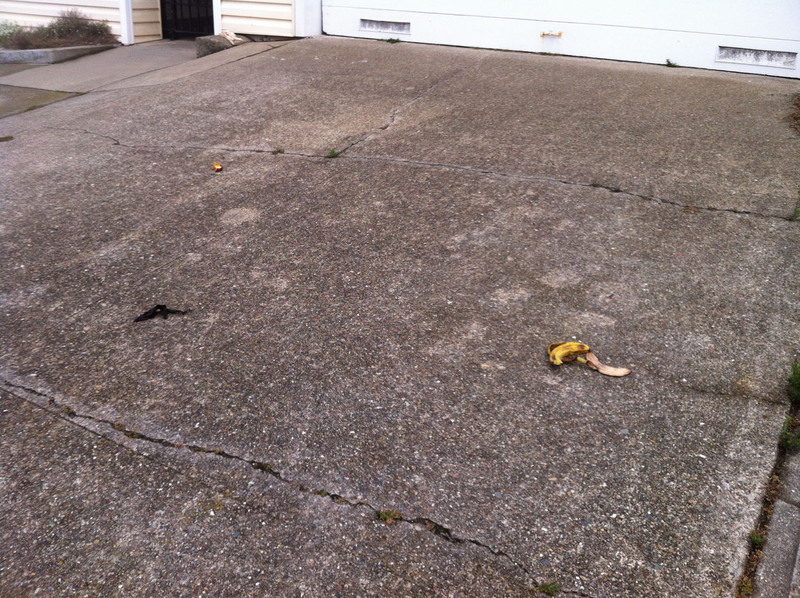 Follow this trail of peels to retrace my steps for the past year. 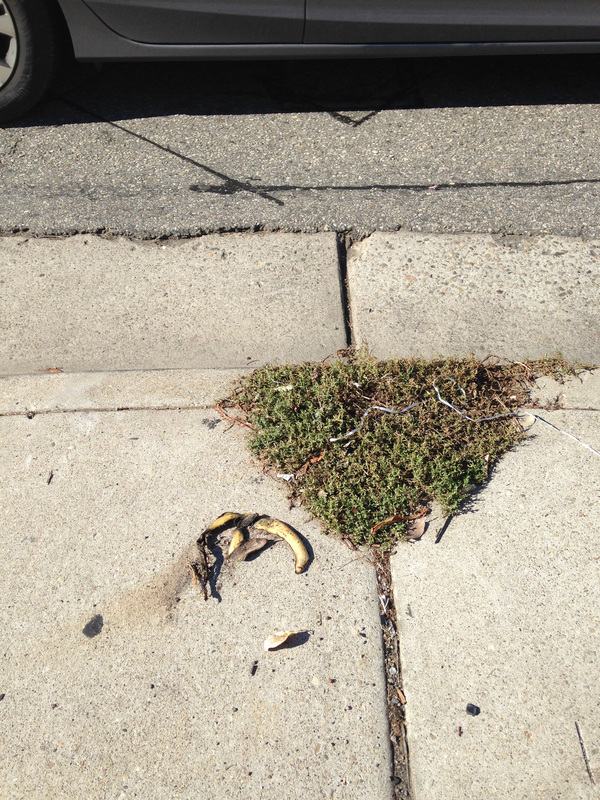 I was probably on my way to Walgreens when I spotted this artfully nibbled PB&J crust and accompanying peel. July 25, at 3:50 PM, near Point Lobos. July 27, 2013, 5:55PM. As I recall, I was walking with a friend near Nob Hill, talking about face oil and its surprising benefits for the complexion. 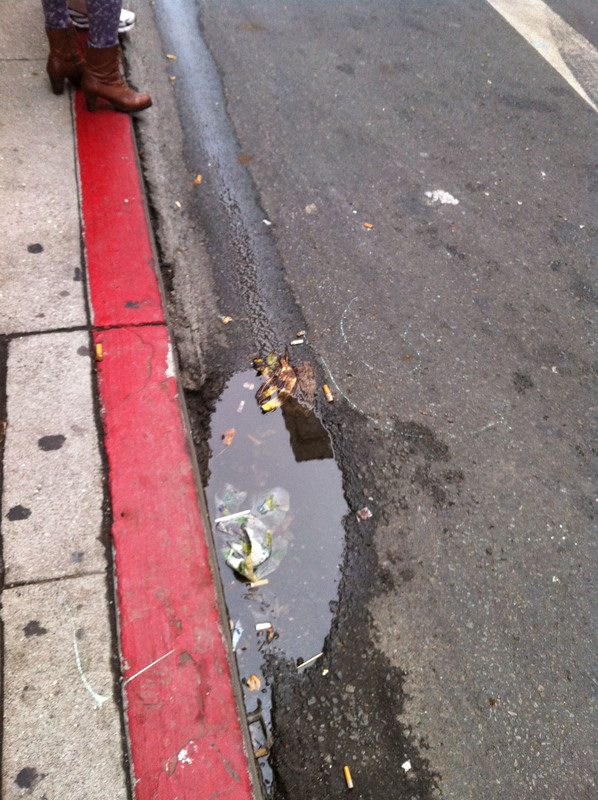 August 1, 8:56 AM, Geary and Taylor. I remember this moment well: waiting for the 38 Geary outside Walgreens. 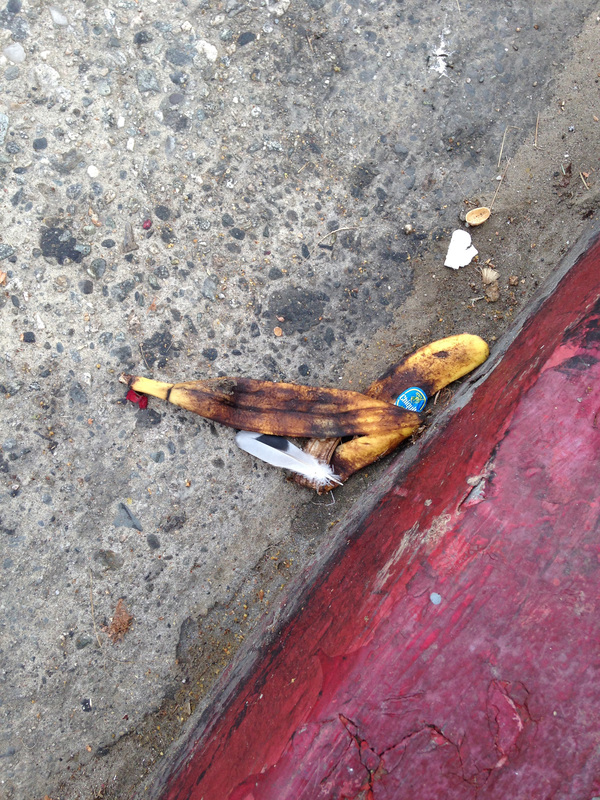 Later that day at 7:45 PM, I must have been out to dinner or something when I spotted this shrunken peel amid the wandering footprints of some disoriented bird. 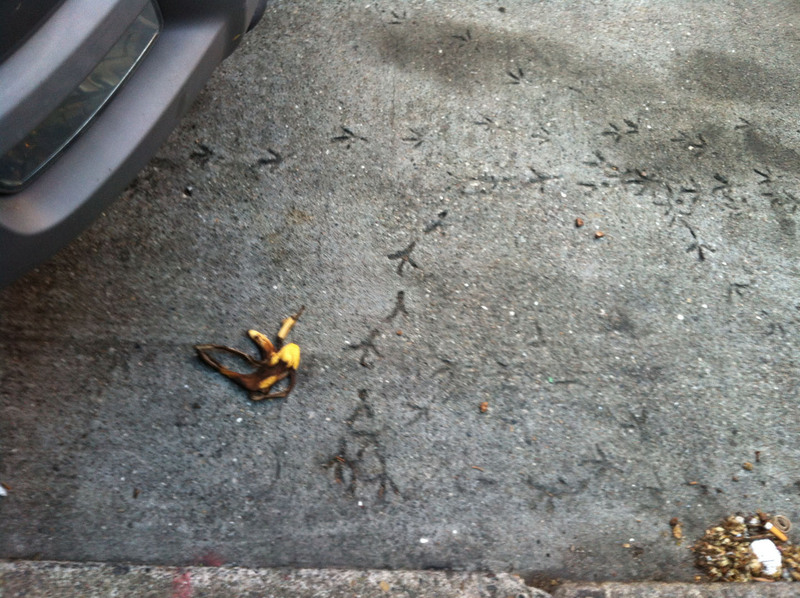 Looks like the bird managed to escape a nasty slip! August 2, 4:12 PM. 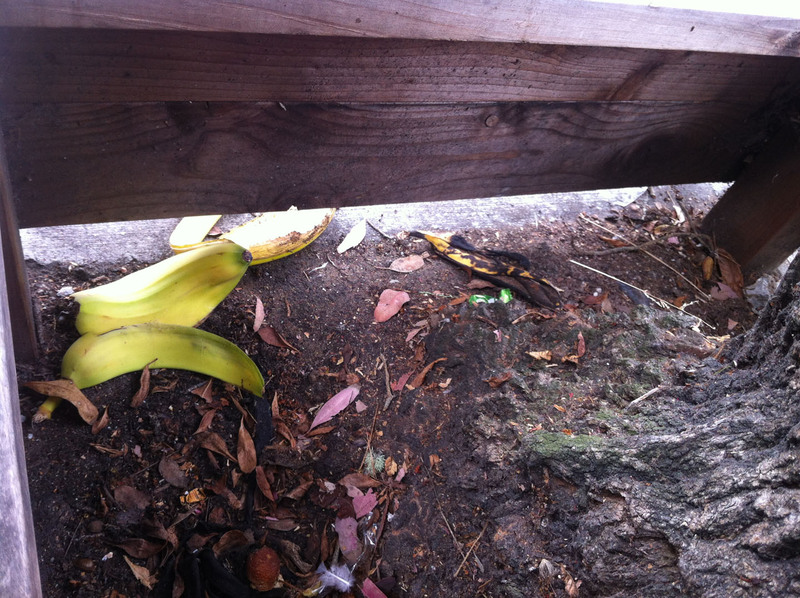 Took the day off and spotted these suspicious characters lurking under a parklet on Clement. August 3, 1:06 PM. It was a Saturday, so what was I doing? This trash can looks familiar, but I can’t remember. August 8, 10:35 AM. It was a Thursday, so I was probably on my way to the dentist.